Here we will prove that of all the straight lines that can be drawn to a straight line from a given point outside it, the perpendicular is the shortest. Given: XY is a straight line and O is a point outside it. OP is perpendicular to XY and OZ is an oblique. To Prove: OP < OZ. 1. In ∆OPZ, ∠OPZ = 90°. 2. 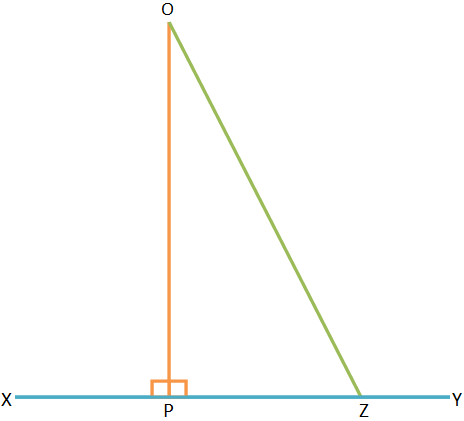 ∠OZP is an acute angle. 2. In a triangle, if one angle is a right angle, the other two must be acute. 3. From statement 1 and 2. 4. In a triangle, the greater angle has the greater side opposite to it.